"Lactose-free milk" is just milk with an added enzyme that helps lactose-intolerant people digest it. 27. Astronaut Samantha Cristoforetti wore a 'Star Trek' uniform in space. 28. Infants will stare at an attractive face longer than an unattractive one. 29. Isreali Labor Party delayed their elections in 2017 because of a Britney Spears concert. They feared that party members would rather go to a concert than find a polling station and vote. 30. Australians don't traditionally celebrate Halloween, and its increasing popularity there is often considered to be an example of encroaching American cultural imperialism, despite it being a millennia-old Celtic European holiday. There are no pain receptors in the brain itself. Surgery can be done on the brain and technically the brain does not feel that pain. But the meninges (coverings around the brain), periosteum (coverings on the bones), and the scalp all have pain receptors, which is where migraines occur. 32. When work crews pulled open a broken BART escalator at San Francisco's Civic Center Station in 2018, they found so much human excrement in its works that they had to call a hazardous-materials team. 33. The Blue Mustang is a 32-foot tall sculpture of a blue horse at Denver International Airport. It was designed by sculptor Luis Jiménez who was unable to complete the project after the head fell on him and severed an artery in his leg, killing him. His staff and family finished the job for him. 34. Ireland was a major hub for slavery in the 11th Century, with the Irish kidnapping people in Ireland, Scotland, and Wales. When slavery was banned in England, it impacted Ireland severely. One of the reasons why the Normans invaded Ireland was because of the Irish refusal to give up slavery. 35. Yellow fever came to the Americas aboard slave ships. Two hundred years later, it helped end slavery in Haiti. An epidemic broke out during the Haitian Revolution, killing two-thirds of the French army and almost none of the slaves and France was forced to surrender the island. 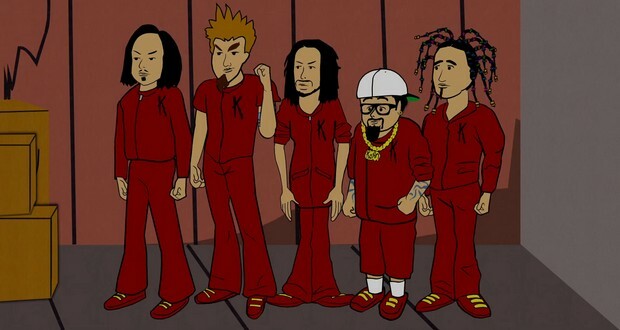 The South Park episode 'Korn's Groovy Pirate Ghost Mystery' served as the world premiere of their song 'Falling Away From Me' which went on to become one of the band's most popular songs ever. 37. The male platypus is venomous and the venom is painful, immediate, long-lasting, and impervious to painkillers. 38. The Teen Talk Barbie's quip "math class is tough" generated controversy among educators who feared it contributed to negative gender stereotypes. It also inspired The Simpsons episode "Lisa vs. Malibu Stacy." 39. Roman general Scipio Africanus who defeated Hannibal, was plagued by corruption accusations from his peers after the war. After his death, he was buried away from Rome with the inscription “Thankless country, thou shalt not possess even my bones” on his tomb. 40. In an interview with Super Mario Odyssey director Kenta Motokura, he confirms that Mario is human. When asked why Mario is so different, Motokura responds "In the world, there are many different types of people, you know." As of August 2018, in Venezuela, you can buy 925,000 gallons of premium gasoline for $1. 42. During the 1980s Japanese property bubble, the value of the Tokyo Imperial Palace was higher than all of the real estate in the state of California. 43. Freddie Mercury had a larger mouth because of the 4 extra teeth he had in his upper jaw. 44. Dr. Bob McClelland was the surgeon who attempted to save John F. Kennedy after his assassination. He also went on to attempt to save Lee Harvey Oswald after his shooting, and even later performed a cancer surgery on Zapruder, the man who filmed JFK’s assassination. 45. “The Full Monty” originally refers to a full English breakfast. It was named after the World War 2 British Army general Bernard Montgomery who, during the North African campaign, started every day with a full English breakfast. The suds of shampoo, soap and many other foaming products are often artificially added to the product to help convince us that it is working. 47. Loofah (the kind used for scrubbing in the shower) is actually an edible vegetable. 48. One of the reasons why the girls that took the Cottingley Fairies photos did not originally state they were fake was because Sir Arthur Conan Doyle believed them to be real, and they did not wish to embarrass him. To the day they died, both girls insisted they had really seen fairies. 49. There was a bull named Bodacious, often described as “The World’s Most Dangerous Bull.” He was infamously known to incapacitate and injure rodeo riders, often crushing their facial bones with his signature power move. He was forced into retirement in 1995 for fear of injuring more competitors. 50. Starbucks' "Frappuccino" is a registered trademark that acts as a sub-license out of the Netherlands. When you purchase a beverage, your money goes to pay a trademark fee, which Starbucks books as losses and the entity in the Netherlands pays little to no tax on the trademark revenues.